Being a huge fan of Valentino’s couture collections, I’m always a little dismayed by the fact that I only own a single Valentino fragrance — 1991’s masterpiece, Vendetta pour Homme. 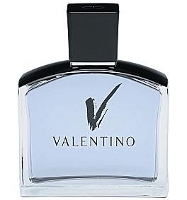 Although a couple of Valentino’s women’s perfumes intrigue me, I’ve never really gotten to know them; likewise, 1999’s Very Valentino for Men smelled pleasant enough, but never really grabbed me. So, it was with high hopes that I tested the new V Pour Homme, a subtly sweet blend of bergamot, mandarin, basil, pink peppercorn, transparent floral, jasmine, mace, cumin, ambrette seed, cedarwood, sandalwood, vanilla, dry amber and musk. Last year’s initial launch in the V family of fragrances, V Pour Femme, was a soft, ambery floral and I’m pleased to say that V Pour Homme follows the theme rather well with sweet floral notes lifting the warmer amber and woods. V opens with a light and fresh yet peppery accord of citrus and jasmine. As the fragrance progresses, the sweetness of the jasmine becomes slightly more pronounced before finally relaxing into the background of darker base notes. Oddly enough, this part of the development is where V pour Homme reminds me of Thierry Mugler’s Alien — I can almost imagine what a men’s version would smell like…and this is it. The jasmine and amber combination is one of my favorites and I’m thrilled to see it put to good use in V. I’m also strongly reminded of Hanae Mori for Men’s sweet gourmand aroma, though in V, the amber notes are tempered by a camphorous cedar and a hint of cumin, not enough to make you think “pits”, but enough to evoke a stronger oriental edge. V is neither groundbreaking nor revolutionary, but for someone like me who loves jasmine, sandalwood, musk, amber, etc, it’s pretty darn close to a Holy Grail scent. If only the entire composition was slightly more intense with richer base notes…as it is, V seems unfinished, somehow. I do love it just the way it is, but can’t help feeling as if something more could have happened: V could have taken one final leap into the air before bowing. Hmmm, I think it’s time for Serge Lutens to re-visit jasmine. With average longevity and sillage, V just might make it through the Winter Olympics of holiday consumerism. If not, that’s fine with me. I’m happy to keep this little gem all for myself. Valentino V Pour Homme can be purchased at Sephora and selected department stores. Anything in the vein of Alien is sure to make me slobber. Must try. Hey, if you're lucky, Valentino will roll out an intense version just like they did with the V for women, which, btw, I liked very much. I've never tried Vendetta and must rectify this soon. Agree that Very Valentino was ok, if not meh, but the gem in their fragrance line is, for me, Valentino Gold for women. Valentino Gold for Women – sound good…I'll put it on my list!